The Gefen ToolBox 8x8 Matrix is a compact and lightweight alternative to rack-mounted matrixes. This HDCP 1.4 compliant matrix routes eight Ultra HD sources to any eight 4K Ultra HD displays with HDMI inputs. Resolutions up to 4K DCI (4096 x 2160 at 24 or 30 Hz 4:4:4), 4K Ultra HD (3860 x 2160 at 60 Hz, 4:2:0 or 30Hz 4:4:4), 1080p Full HD, and 1920x1200 (WUXGA) are supported. 3D, Deep Color, and multichannel digital audio including 7.1 channels of LPCM and HBR (High Bit Rate) formats such as Dolby�TrueHD, and DTS-HD Master Audio� are also passed through. The Gefen Syner-G� software's Discovery and Show-Me features simplify initial IP configuration of this matrix. Each source can be routed to any display location, using the front-panel push buttons or the included handheld IR Remote Control. 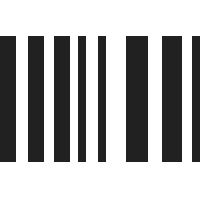 The matrix can also be controlled via RS-232, Telnet, UDP, and the Gefen intuitive and easy-to-use web server interface. An easy-to-read backlit front panel display indicates the current routing status and IP settings. Use HDMI cables to connect up to eight sources with HDMI outputs to the inputs of the matrix. 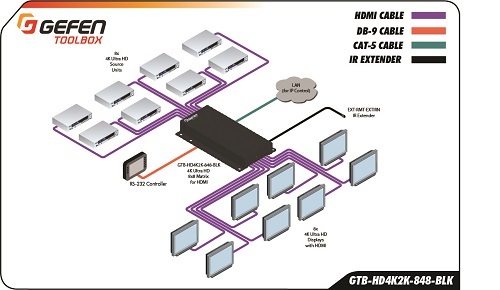 Connect up to eight displays with HDMI inputs to the outputs of the matrix, using HDMI cables. Connect an Ethernet cable from the network to the RJ-45 connector to use the built-in web server or Telnet/UDP capability to control routing, EDID management, and other functions. Connect an RS-232 cable between an automation control device and the matrix. Connect the included power supply to the 24V DC connector on the matrix. Plug the IEC AC power cord to the power supply and to an available AC outlet. To control the matrix via IR, point the included IR remote towards the display of the unit. If matrix is not located in the line of sight of the handheld remote, attach a Gefen EXT-RMT-EXTIRN IR Extender to the IR Ext port of the matrix and install it in a location where it can receive the IR commands. If this matrix is going to be part of an IP-controlled infrastructure, use Gefen Syner-G� to perform the initial IP configuration and setup. Question: what is the max length i can run the hdmi cable from the box to display without losing signal? Answer: Hi Hakim, thank you for your inquiry. Although no maximum length for a passive HDMI cable is specified, signal attenuation (dependent on the cable's construction quality, conducting materials, and signal source) limits usable lengths in practice. We generally recommend a max distance of 15 feet using low speed passive HDMI cables, and 25 feet using high speed passive HDMI cables - up to 50ft is possible with a passive cable but it depends on your setup.